Two connected rooms (E5-5121 and E5-5123) are the host of Machine Perception and Sensors, Autonomous Systems and Mobile Robotics labs of CPAMI. 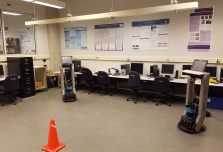 The main focus in this lab is on the experimental side of research; most of the implementations of the CPAMI robotic projects are conducted here. Multiagent systems, cooperative robots, real-time distributed coordination and control, smart mechatronics, multiagent communication and protocols, cognitive robotics and assistive environments.